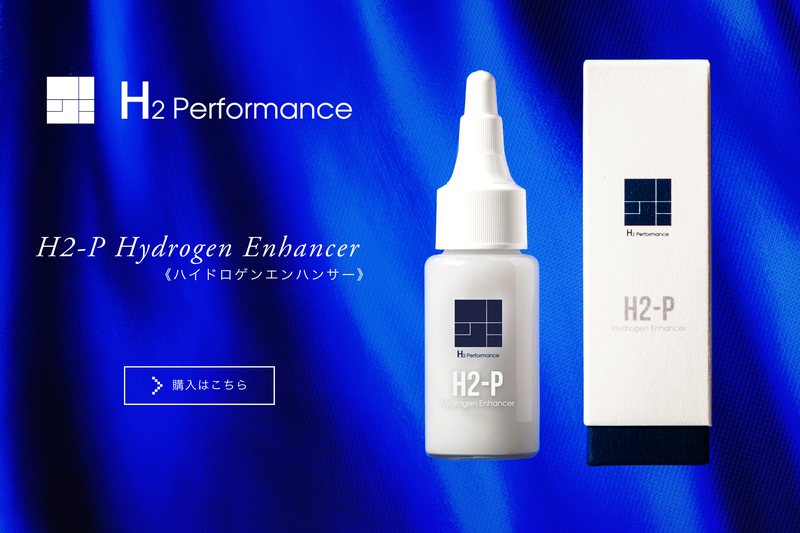 H2-P Hydrogen Enhancer is an unparalleled drop of beauty that can transform your cosmetics into a hydrogen treatment. 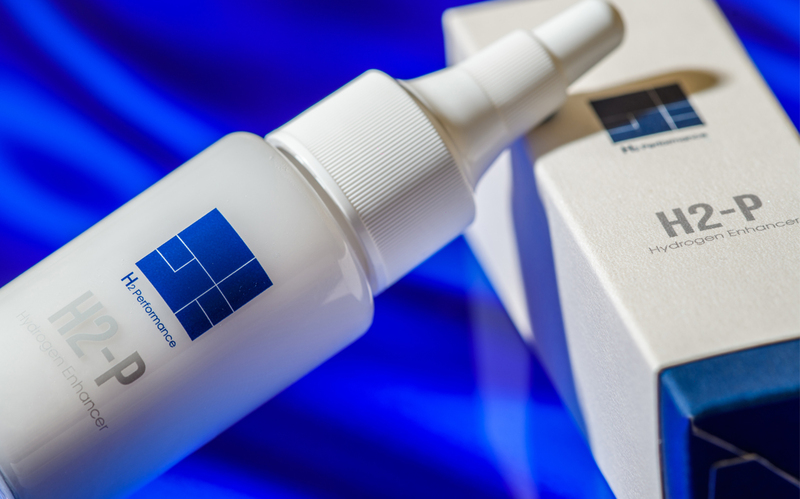 It is an ultra-powerful, drop-type hydrogen-generating agent that produces sufficient hydrogen with a single drop to protect your skin cells, tissue under the skin, and muscle cells. One bottle contains about 600 drops. Simply mix it in your serum, emulsion, UV cream, shampoo, lip cream, oil, or body cream, etc. ; you don't need to buy any new cosmetics. Since it's hydrogen, it causes no damage and can be used anywhere on the body. It can also be used for stiff shoulders, rough skin, or in toothpaste. What seems like a drop of magic that isn't cosmetics or medication has just arrived. Note: H2-P Hydrogen Enhancer is not a cosmetic. Beyond cosmetics…. Its an unparolleled drop of beauty. H2-P Hydrogen Enhancer is no problem whether you apply it directly, mix it with cosmetics or other products you have, or apply it in layers.It generates hydrogen over a long period of time, and continues to remove active oxygen generated from the surface or the interior of skin or hair. 3. When using it with UV cream on the face, mix 2 to 6 drops with a product you want to use. 4. When using it with a hair conditioner, people with short hair should mix about 5 drops and people with long hair should mix about 20 drops into their rinse or hair treatment after shampooing, gently apply it to the hair, and leave it there for about 5 minutes before rinsing. 5. Add 1 to 2 drops to toothpaste powder, and use it to massage the gums. 6. With body cream or massage cream. 1. For lips, place 1 to 2 drops on a fingertip and gently massage the lips with it. There's no problem if you lick it. 2. When using it as a face cream, place a few drops on your hand and apply it to your entire face. 3. When using it as a nail cream, place 1 to 2 drops on a fingertip and gently apply it on the nails and the skin around the nails. 4. Before using a face mask, slowly apply 2 to 6 drops onto your entire face, and then apply your face mask. top hair make-up artist, also recommends this quality to you. Hydrogen improves respiratory disorders caused by tobacco. Although it is clear that chronic obstructive pulmonary disease (COPD) is induced by such factors as tobacco and PM2.5 that has become problematic in recent years, which are the causative substances for respiratory disorders, excessive production of airway mucus is the main symptom of COPD that includes bronchial asthma, and it can be said that this mucus contributes to the conditions of these disorders and higher death rates. IL-13, which is Th2 cytokine, is the central mediator in the pathophysiology of asthma that includes excessive production of mucus, and active oxygen is significantly involved in this system. In this paper, an oxidized physiological saline solution was administered intraperitoneally to rats, and changes in various types of mediators that were subject to tobacco smoke were investigated. The results confirm a high degree of efficacy: the preparations of oxidized physiological saline solution suppressed the accumulation of smoke-induced mucus in the bronchial lumens, excessive formation of goblet cells, overexpression of MUC5AC and abnormal cells inside BALF, apoptosis in the respiratory epithelium, and increases in malondialdehyde. In addition, papers on improvements in pulmonary emphysema and reductions in bronchial asthma attacks are also starting to be submitted. While cases have been few, this hospital is also beginning to see cases of improvements in COPD, though a minimum of three months is considered necessary, and of course abstinence from smoking is essential. And in China where PM2.5 is believed to be a cause of respiratory disorders, it is difficult to change the location and ongoing treatment is considered a necessity. Immediate-type allergies are known as Type I allergies, among which atopic dermatitis, hives, bronchial asthma, and allergic rhinitis (hay fever) are well known. In these allergies, an immunoglobulin known as IgE binds with mast cells and other white blood cells, and because antigens bind to these cells, they discharge physiologically active substances such as histamine and serotonin. This causes vasodilatation, vascular hyperlucency and other conditions, and symptoms of inflammatory response (pain, fever, red flares, and edema) appear. In this paper, experiments with mice were conducted to study the mechanisms through which hydrogen causes immediate-type (Type I) allergies to disappear. Broadly speaking, in the immune/inflammatory response, "NADPH oxidase" contributes to the response amplification effect (referred to as the "feed-forward loop" in the paper), and the section stating that "hydrogen is endowed with the effect of inhibiting this NADPH oxidase activity" plays the main role in the effect of suppressing these allergies. In other words, the effect of hydrogen against Type 1 allergies, unlike that of antihistamine, NSAIDS, or steroids, which block or suppress the main stream of immune/inflammatory responses, is claimed to "mitigate symptoms by suppressing the mechanism (feed-forward loop) that amplifies this stream; rather than shutting down the immune/inflammatory response, the portion that is in excess (the amplification effect) is suppressed". At this hospital, we frequently hear comments from patients who have been undergoing continuous hydrogen treatment, such as "This year's hay fever was mild", "I no longer have metallic allergies", "My nasal inflammation (rhinitis) was cured", and "The hives are not so bad anymore". For these reasons, the "suppression of the immune/inflammatory amplification response" approach personally makes sense. I think it is important to continue this research from a variety of perspectives. An overview of the effects of hydrogen on the human body is starting to become clearer, and they seem to center on antioxidative action and attendant “anti-inflammatory and ant-allergic action”. This anti-inflammatory and ant-allergic action is effective because it controls “cytokine”. In simple terms, cytokine can be described as “a system through which cells communicate with one another”. While the nerve center sends commands to cells via hormones and neurotransmission, peripheral cells contact each other using a secreted protein called cytokine. The broad categories of cytokine include: * Interleukin * Interferon * TNF * CSF * Growth factor (CF) In addition to the commands from the nerve center, cytokine is secreted from each cell also by immune/inflammatory responses at the periphery. Since active oxygen is significantly involved in the immune/inflammatory responses, hydrogen seems to influence these secretions of cytokine. Returning now to the main topic, the ability of hydrogen to control cytokine plays an important role in its influence on cancer cells. In this paper, the cytokine (growth factor) known as the “vascular endothelial growth factor (VEGF)” seems to be involved. The feature of neoplastic cells is their rapid growth speed and consumption of large amounts of nutrition (sugar) compared with normal cells. A vascular network beyond normal tissues is required when large amounts of nutrition are continuously sent to neoplastic cells. This is because VEGF is secreted from tumor tissues and countless capillary vessels are constructed in the area around the tumor. This paper aims to demonstrate that hydrogen inhibits tumor growth by controlling VEGF secreted from tumor cells and inhibiting the proliferation of capillary vessels. Other papers claim that this effect is limited to tumor cells and has no effect on normal cells, and it seems that a possible reason for this, that abnormal secretion is inhibited rather than normal secretion, would be correct. http://0-www.ncbi.nlm.nih.gov.elis.tmu.edu.tw/pubmed/19192719 http://0-www.ncbi.nlm.nih.gov.elis.tmu.edu.tw/pubmed/21448340 Many papers were submitted after this, and deciphering the papers to date, it seems correct to think that the effect of hydrogen on cancer would be to inhibit the growth of cancerous tumors. Another paper asserts that “hydrogen inhibits the side effects of radiotherapy and anticancer drugs and does not interfere with their effects”. It is thus intriguing that hydrogen can be used with other treatments. The approaches to cancer therapy are either to completely beat the cancer (eliminating it from the body) or to co-exist with the cancer (suppress growth and prevent it from running out of control). Personally, as with other disorders, it seems that the approach of getting along well with the ailment would also be good. Skin can be divided into the epidermis of ectodermal origin and the dermis of mesodermal origin. An approach to both of these is required for skin regeneration. When one hears the term “regenerative medicine,” one imagines aspects of beauty care such as macules, wrinkles, or flabbiness, but an easier aspect to understand is decubitus, or bedsores. With bedsores, there is a loss of epidermal and mesodermal skin tissue, and because infections entering from there are life-threatening, immediate treatment is necessary, but there are no effective treatments. In the current paper, hydrogen water is administered to the bedridden patient with bedsores through a feeding tube, and the paper aims to confirm the effects of bedsore treatments and examine the cornification of epidermal keratinocytes and mesodermal fibroblasts when they were cultured with hydrogen and their ability to become cornified and produce collagen. The paper clearly confirmed skin tissue regeneration in the group administered with hydrogen but not in the group administered with a placebo (pure water). With the cultured cells, interstitial active oxygen was quantified for UVA irradiated HaCaT cells (keratinocytes), and it was found that active oxygen was reduced in the hydrogen cultures but not in the pure water cultures. In addition, nuclear condensation and segmentation occurred with the UVA irradiated HaCaT cells cultured in pure water but mostly not with cells cultured in hydrogen water. The mitochondria reductive capacity and the Type 1 collagen synthesis of OUMS-36 cells (fibroblasts) of HaCaT cells that were UVA irradiated and cultured in pure water both declined, but they did not decline when cultured in hydrogen water. These results demonstrate that the administration of hydrogen inhibits oxidation degradation in cell clusters making up the skin, and by normalizing their functions, the skin is regenerated. The fact that improvements in bedsores were also observed in concrete clinical cases is extremely noteworthy, indicating that these benefits could be promising for mitigating the ageing of skin and other ailments. Most patients at this hospital who have been continuously taking hydrogen internally, externally, or through drips have also experienced improvements in skin quality, possibly due to positive effects from the restoration of keratinocytes and fibroblasts.